We've not had much quality time with the Charge 3 but Fitbit's devices are so familiar that – barring something catastrophic happening like exploding batteries or sensor failure – we can already tell you exactly what it will be like. And what it will be like is: best in its class, and yet still rather underwhelming. How many times can Fitbit keep putting out the same features in different-shaped devices? Fitbit has long been the leader in fitness trackers. That was originally with step counters such as the Alta, but they also have more serious running watch and smartwatch type devices such as the Versa and Ionic. However the really BIG products for the brand are actually the Charge series, which are somewhere in the middle, with pulse tracking, GPS (albeit via your smartphone rather than built in) and basic smartwatch type features, in a relatively small package that is still recognisably a band rather than a watch. And now there is a third one. And it is called the Fitbit Charge 3. It's an unimaginative name, but with a few new features – waterproofing to 50m down, a contactless payment system, a more comfortable fit and, uh, a new type of button – it perfects the template laid down by the Charge HR and Charge 2. You can pre-order the Fitbit Charge 3 now, with units shipping in early October. The Charge 3 sits more comfortably and just as discreetly on your wrist as the Charge 2, despite greatly increased (40% bigger) touchscreen real estate. The button of old is now a capacitive thing with subtle vibrating feedback that, to be honest, is not as good as an actual button. It does allow the Charge 3 to be waterproof however, so it's a worthy addition. Also new and improved is a full, 7-day battery life (up from 5). There's Fitbit's contactless payment system too, although this is only supported by Santander and a few 'challenger' banks in the UK. Despite all these improvements, the Charge 3 is notably lighter than its predecessor. I don't think it's actually any more attractive than the earlier Charges, but it is a literally more wearable, wearable. As noted, the headline improvement is full waterproofing for the first time on a Charge. This means you can wear it in the pool, where it will count your laps, or the bath, where it won't. In terms of comfort if not sexiness, the Charge 3 is greatly improved. The reason I don't think it necessarily looks better is that the Charge 2 was more masculine looking, at least to my eyes, whereas the Charge 3 has a more unisex feel. And I am a man, alas. The main issue with Fitbits – and practically all other fitness wearables – is that they don't coach you to get better, or tell you how well you're doing in a useful and relatable way. They just give you a bunch of isolated stats and leave you to get on with it. However, there are little signs that Fitbit has recognised this and wants to change things. Okay, that's a bit woolly, but done right, actually could be a life-changer. We'll have to wait and see. However, this is a) not saying much, considering how hopelessly inaccurate Charge 2 is when you're really going for it and b) possibly stretching a point on the other claim. I think what this means in practice is that it will do nothing at all of any use at launch, but could become useful in the future. Another interesting innovation, although again not perhaps a life-changer, is the option to set goals for your workouts. So whether you're cycling, swimming, running or lifting, you can opt to be alerted when you reach your chosen target for calories burned, distance or duration. This is a solid, motivational feature potentially, and I can confirm that the little celebration graphics when you hit targets are on point. The screens on the Charge 3 will now show data you'd previously need to go into the app for, such as hydration, sleep and weight. 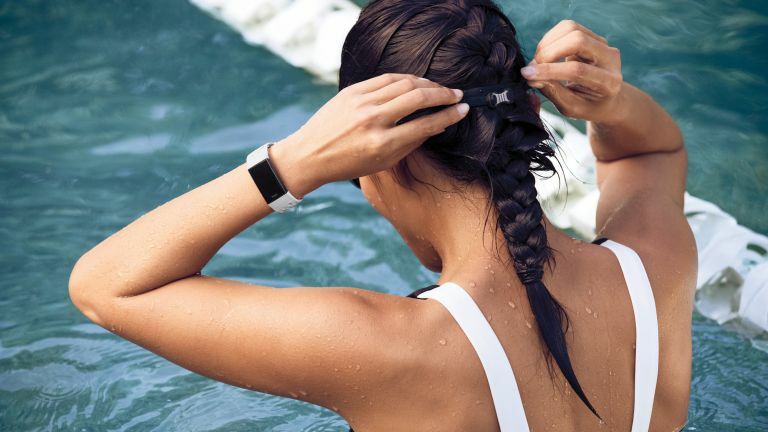 There are familiar features from previous Fitbits, such as being able to tap into your phone's GPS to get real-time speed and distance stats when running or cycling, plus the very handy, if not always 100% reliable Run Detect, which automatically starts tracking you when it notices you're running. The Versa's Female health tracking is also on hand to log your periods and, with a forthcoming software update, calculate ovulation. Fitbit Charge 3 is available in black with a graphite aluminium case or blue-gray with a rose gold aluminium case for £129.99. A Charge 3 Special Edition is available for £149.99 and has NFC, and is the only model that supports Fitbit Pay. It also boasts 'an exclusive, white silicone sports band with a graphite aluminium case or lavender woven band with a rose gold aluminium case'. So that's nice. Additional straps cost from 19.99 to £59.99 and are way easier to put on and take off than they used to be. First up, let's just reiterate that we've not actually used the Charge 3 in anger. And yet its promised feature set is so familiar, and Fitbit's quality control so reliable, that we feel like we already know exactly what it will be like to use. It is comfortable, it will give people data they may or may not use, and will help to motivate them, a bit, via Fitbit's excellently laid out app and popular social network. We'd argue that there's a lot good about the Charge 3, and almost nothing exciting. It's like certain recent flagship phones – which, sure, are beautiful and awesome devices by any reasonable metric, yet raise little more than a shrug because they are really not a huge leap forward from last year's model. But more so, because unlike phones fitness wearables have never been all that beautiful, or all that awesome. They're accessories, not essentials. So our early verdict and likely final verdict is this: by definition, Charge 3 should be the best 'traditional' fitness tracker you can buy, when it ship in October – the Charge 2 has been top of our Best Trackers list since its launch in 2016, and it beats that in most ways. Nothing about it will surprise anyone, though. What will be interesting to see is firstly whether Fitbit can really deliver personalised and genuinely useful insights into your health, fitness and sleeping habits, as it's promising. And secondly, whether it takes an entirely different approach with future products. Because seriously, after the Charge 2, Blaze, Ionic and Versa, we feel like we've seen this set of core features in slightly differently-shaped wearables quite enough now.